While my kids aren't yet old enough to be living with billet families or routinely going to games on a team bus, I think I, as well as pretty much any other hockey parent, can relate to the despair all of those families must be feeling right now. I'd imagine it would still feel surreal...and probably will for some time. But I think that I'd find great solace in knowing my child had been doing what they loved to do and died surrounded by their best friends. I mean, can you imagine how much fun a bus ride with 20 of your best friends would have been at that age? 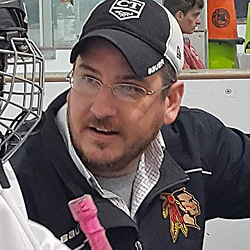 One parent, who'd lost their son, said on a news report something to the effect of "My son enjoyed being a teammate more than even playing hockey." If there's one thing I've noticed in elite hockey that's different from any other team or group my kids, or even myself have been a part of...it's that the team really does become a family -- the game becomes secondary. As young as my children are, their "real" friends are their teammates. Sheesh, even my friends are my kids' teammate's parents. And even as some of them move on to different teams or programs, you know what? They're still part of the family. Hey, even though you're not on our team anymore, we're gonna follow your new team to keep tabs on how you're doing, and you'll still on our shortlist for Fortnite...and that's not going to change. I think that's what makes the hockey world feel so small -- teammates aren't just a bunch of random nobodies. After a season or two together, they're new brothers and sisters. I've joked before that my 8 year old probably has less than one degree of separation from every 7-year old through 11-year old hockey player from Maryland to Maine...but it's true. Imagine how big that family becomes by they time the kids are 18, 19, and 20 years old. I'd bet the wave of heartache in Saskatchewan, Alberta, and even eastward into Manitoba is massive...and far beyond just the immediate families that lost a son. Too many. Too young. Too close to home. » What does it mean to be coachable? And why it's so important.